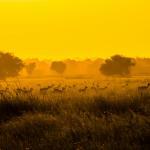 As I mentioned in the previous post that I was traveling to Tal Chapar wildlife sanctuary in Rajasthan. I had to travel to Ratangarh from Delhi in order to reach Chapar, so I decided to take a train and booked my tickets online using Indian Railways online ticket booking website. Now Rajasthan most people relate to three things Forts, Palaces and dunes in desert forgetting there are many more wonders that Rajasthan has to offer, and I will cover one such hidden gem of Rajasthan in this series. This Delhi-Bikaner route till about a decade ago used to be on Narrow gauge train and was converted to broad gauge to save the time of the travelers, only when the conversion completed somebody forgot to change the timetable. The train still takes 6 hours to cover 320 odd kilometers between Delhi and Ratangarh, traveling at a leisurely pace. But this slow speed allows you to soak in the relaxed rustic Rajasthan that a plane drop in Jaipur or Udaipur will never be able to provide. Ratangarh is on the Bikaner route and the train passes through areas that even today are fairly unknown and not visited by many tourists. Our train was from Sarai Rohilla ( one of the Sarais or resting place that were on route to the city of Delhi when it was the capital of the Mughal empire) station and takes the scenic route via Gurgaon, Rewari, Mahendargarh, Loharu, Churu, Ratangarh and then continuing its journey towards Bikaner, the birthplace of world famous Bikaneri Bhujia. 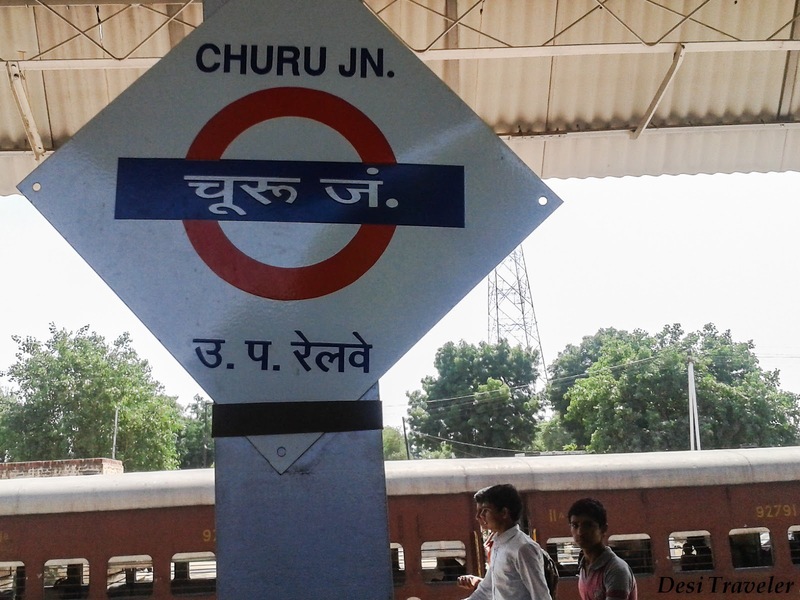 It also passes through Churu which is one of the hottest places in India with temperatures recorded up to 48.5 degree Celsius. Loharu is the station to get down for Pilani known for BITS Pilani founded by Birlas in their hometown. 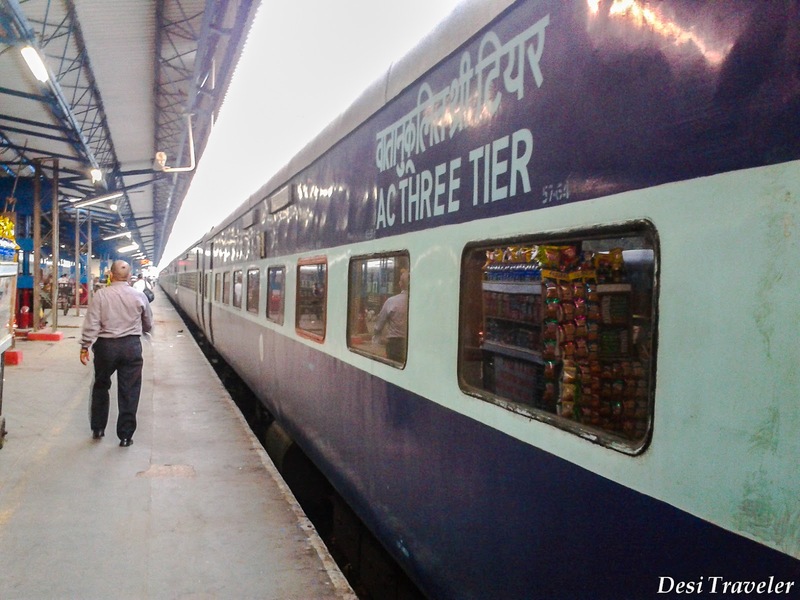 The Sarai Rohilla station though in heart of Delhi has borrowed some of the relaxed atmosphere of small town India and all the hustle bustle of New Delhi and Nizamuddin station was missing. This kind of set the tone for me to what to expect. They say if you really want to experience India then travel by train, and the AC coaches now are really good and comfortable, you get to interact with fellow travelers, unlike in a plane where everybody is trying to avoid eye contact. While this train (Bikaner Intercity) is no Palace on Wheels it is comfortable and what it lacks in royal splendor it more than makes up by providing you beautiful views of the rural Rajasthan, farmers working in fields, kids jumping in small ponds, camels enjoying the scarce shade of small trees fighting the heat and dry air, nests of baya weaver bird so close to the track that you feel like touching them. Every now and then a vendor will come and offer you tea or some other snacks to pass time. I asked one of the tea vendors if the tea was with less sugar. He was very upset that I am questioning the quality of his tea and offered to give me a free cup of tea and to pay only if I like it! Needless to say it was wonderful tea, laced with ginger and basil leaves made in true Desi masala tea tradition. I happily paid him the princely sum of INR 6 for the cup of tea. When I say scenic I mean you get to see still rustic Rajasthan once you enter the state after crossing the border from Haryana. 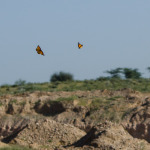 The landscape changes suddenly from the lush green fields of Haryana you start seeing sparsely cultivated sand patches in Rajasthan. The crop also changes from thirsty paddy and wheat to Barley and guar beans crops. Suddenly camels are everywhere and you see them carrying people and goods right next to the rail track. The atmosphere in the train is like a small family gathering as this train does not cover any business or major tourist attraction you find local families all around you chatting in a mixture of Hindi and Marwari with a garnish of English here and there. Though the train stops only for a few minutes on stations it is enough to give you a glimpse of life there. Families still come in groups to say goodbye to a cousin who is going just a few hours away to a bigger city either for a job or to study. Soon lunch boxes open and the aromas of Rajasthan spices start taking you to aromas from the desert. It became very difficult for me to control looking at people relishing the local home cooked delicacies like Gatte kee subji, lehsoon kee chatnee ( garlic sauce), Bajra Roti ( millet bread) etc. 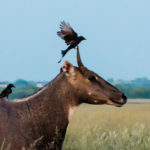 I took out my energy bar and started munching on them, looking forward to the lunch at the forest rest house we were to stay, that is managed by avid birder and photographer Sharad Sridhar. 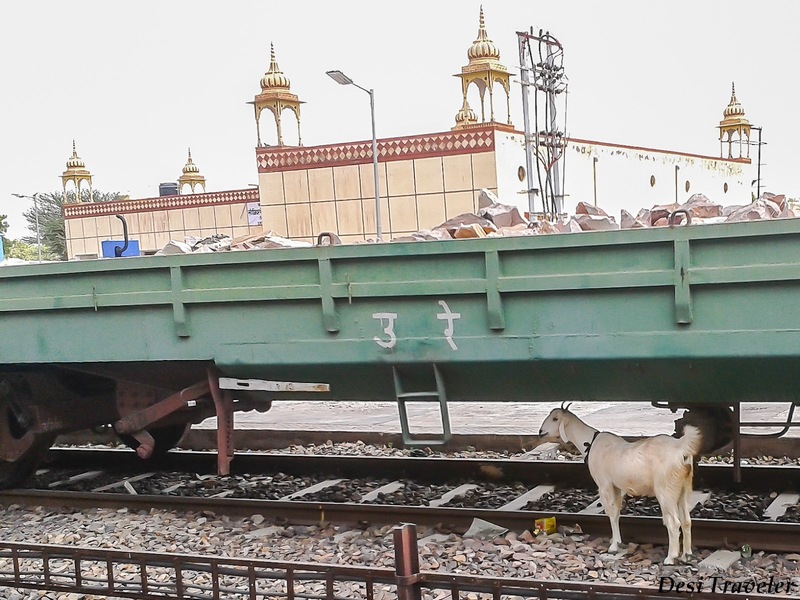 Alas the journey soon came to an end we got down at Ratangarh junction which has maintained its old world charm, there were a few goats that were enjoying the shade under the bogie of goods train standing still. Perhaps the goats also know that nobody is in a hurry in Ratangarh so the goods train will not move anytime soon. 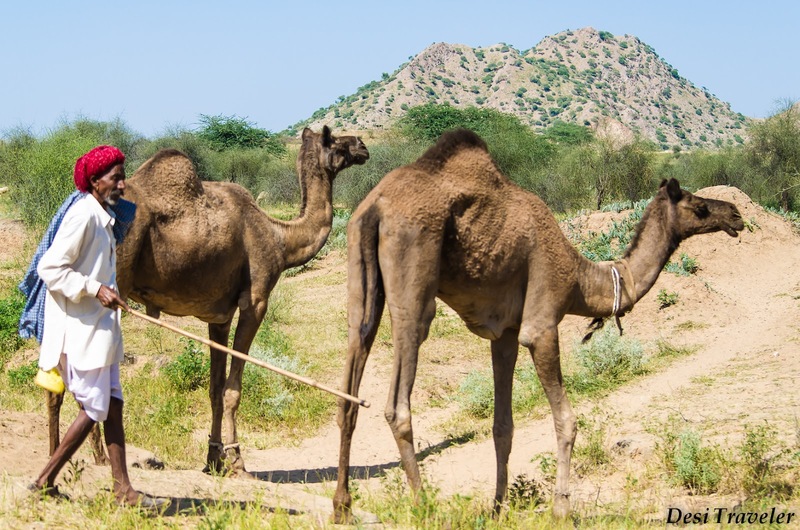 So friends if you are planning a trip to Rajasthan next time ditch your car, forget the plane and take a slow train to Rajasthan to start your Royal and rustic Rajasthan experiences even before you reach there. 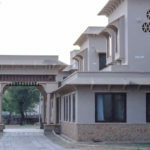 Thanks for reading do like Facebook page of Desi Traveler by clicking here. A very relaxed post indeed , befitting the journey you undertook. My regret is not travelling the Bikaner route. I liked Rajasthan very much, for the relaxed style and lovely hills. Thanks for sharing. Hope the narration on hte stay at Rajasthan will follow. Hi Pattu Mam… thanks for your encouragement, I am writing more posts on this series and will sure cover more things including stay and some action in Jungle.. Excellent pictures and a beautiful narrative. I am glad that I dropped by this post. Nice read! A train around Rajasthan! What a great idea! A very nice post; you made me yearn for a proper Indian train journey. You also reminded me of my train trip to Jaisalmer a long time ago. It was on that train that I first saw desert sands and it's an experience I'll never forget. I had dreamed of visiting a sandy desert and that trip made that wish come true. Hi D. Nambiar…trains continue to fascinate the travelers around the globe…planning to take the toy train to hills soon..
Hi Jim…Thanks for stopping by, am glad you liked the post. Trains are surely the way to go if one is exploring India. Thanks a lot.